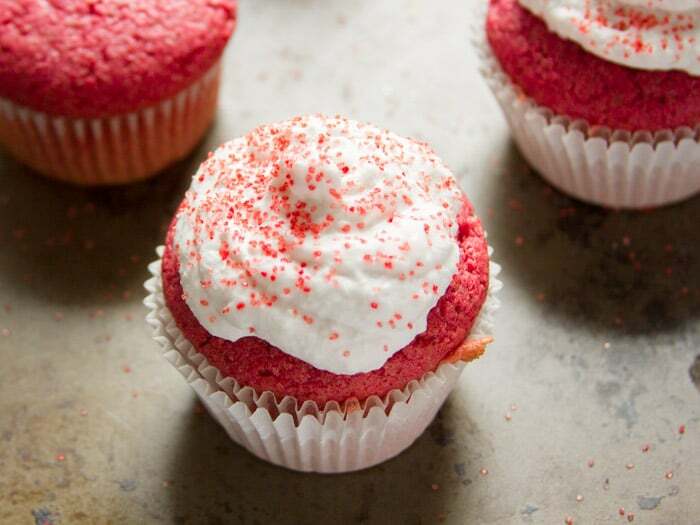 These pink velvet cupcakes are the perfect vegan Valentine’s Day treat. They’re moist, fluffy, and get their vibrant color from an unexpected ingredient. Sometimes I forget how old I am or when my birthday is. I take it as a sign that I’m getting on up there in years. Well guess what? Up until just a couple of days ago I forgot that today my blog would be turning five years old! The big oh-five guys! That’s a lot in blog years, as is evidenced by my forgetfulness. Celebrate with me, will you? And then get off my lawn! Hehe. It worked out nicely though, because I’d been planning on sharing a sweet treat for Valentine’s day right about now. Normally I’m all about chocolate when it comes to pretty much every holiday, but I recently discovered that pink velvet cupcakes are a thing and decided the world needed a vegan version. I also had the perfect plan for how to make that happen. Remember when I posted these chocolate beet cupcakes a few Valentine’s Days ago? If not, make them. Make them and these. They’re both delicious! I was going for red velvet with those cakes, but with the chocolate and all they turned out more like reddish velvet cupcakes, even with the recipe calling for three beets. But if the cupcakes were vanilla, well then the beet color should come right through and give you some pretty pink cupcakes right? It does! You can’t taste the beets at all, I promise! You only need one little tiny beet for the whole batch, and I used lots of vanilla. They honestly tasted way better than I expected them to. You know how sometimes you see food that’s a weird color and expect it to taste weird? Well I think that’s what was going on. 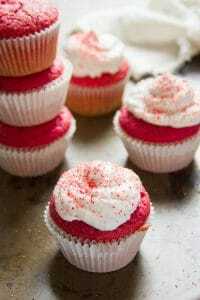 Like, even having made the cupcakes myself I expected some super sweet artificial fruit flavor. But really, they taste like the mellowest, vanilla-y-est, yummy cupcakes you ever tasted. I hesitate to say this, but I might just take one of these babies over chocolate. 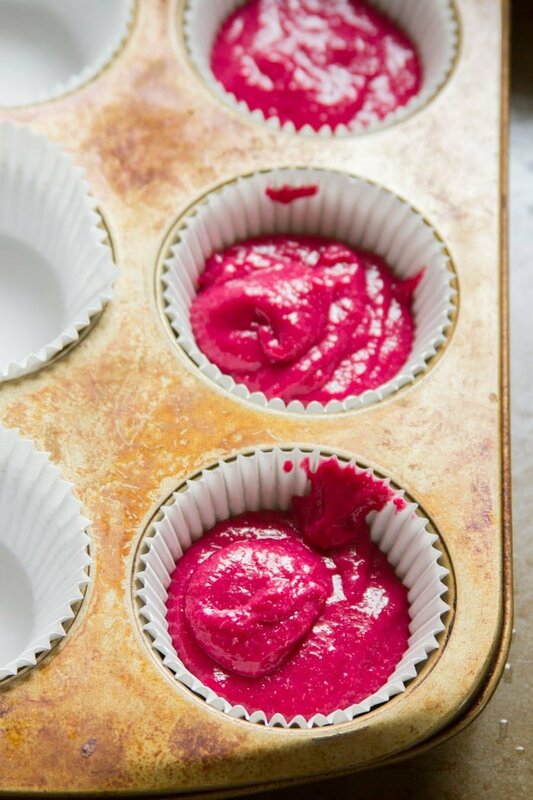 These pink velvet cupcakes are the perfect vegan Valentine's Day treat. They're moist, fluffy, and get their vibrant color from an unexpected ingredient. Place the beet into a small saucepan and cover with water. Place the pot over high heat and bring the water to a boil. Lower heat and allow to simmer until the beet is easily pierced with a fork, about 45-55 minutes. Drain the water and allow the beet to cool for a few minutes. While the beet cools, stir the flour, sugar, baking powder, and salt together in a large mixing bowl. Preheat the oven to 350° and line 10 cups of a muffin tin with papers. When the beet is cool enough to handle, gently rub the outer surface with your fingers to remove the peel. 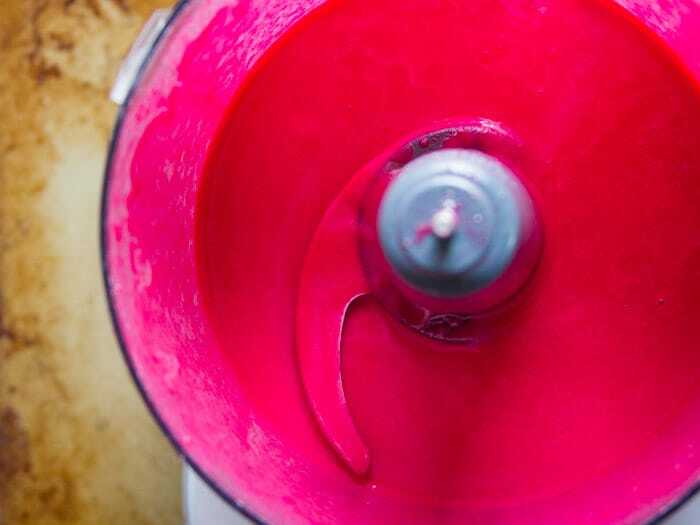 Cut the beet into 3-4 chunks and place them into the bowl of a food processor or blender. Add the milk, oil, and vanilla, then blend until completely smooth, stopping to scrape down the sides of the bowl or pitcher as needed. Add the beet mixture to the bowl with the dry ingredients, scraping down the sides of the bowl or pitcher well to make sure you get it all out. Beat the wet mixture into the dry with an electric mixer on high speed, just until fully blended, about 1 minute. Spoon the batter into the paper lined muffin cups, filling each about 2/3 of the way full. Bake 24-26 minutes, until the tops spring back when lightly touched. 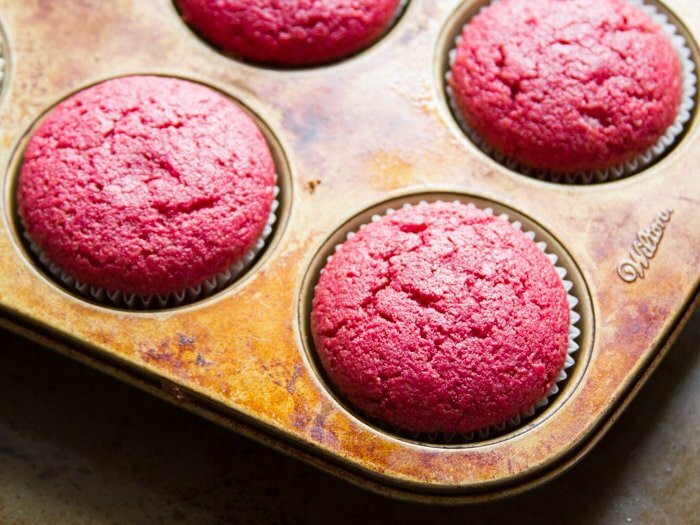 Transfer the muffin tin to a cooling rack to cool. Open the can of coconut cream and scoop the solids into a large mixing bowl, discarding any liquid or saving it for another use. Beat the coconut cream on high speed with an electric mixer, just until fluffy, about 1 minute. Beat in the maple syrup. Chill the mixture until ready to use. When the muffins are cool, top with frosting. Serve immediately or cover and chill for up to 2 days. If you prefer a vegan cream cheese frosting, try this. I recommend this method if you'd like to create your own vegan decorative sugar. 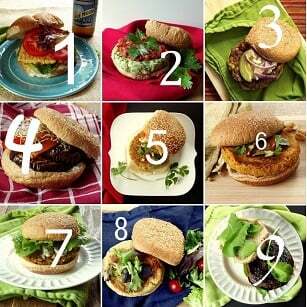 These look beautiful and easy to make. I will definitely be making them next week! Thanks for another awesome recipe. Thanks Alex! I hope you enjoy them as much as I did! Beautiful! II’ll reduce the fat a little. Thank you!! I’d love to hear how it works out! Hi there, what temperature do you bake the cupcakes? happy (belated) blog birthday! these look delicious. Awww…thank you and thank you! !